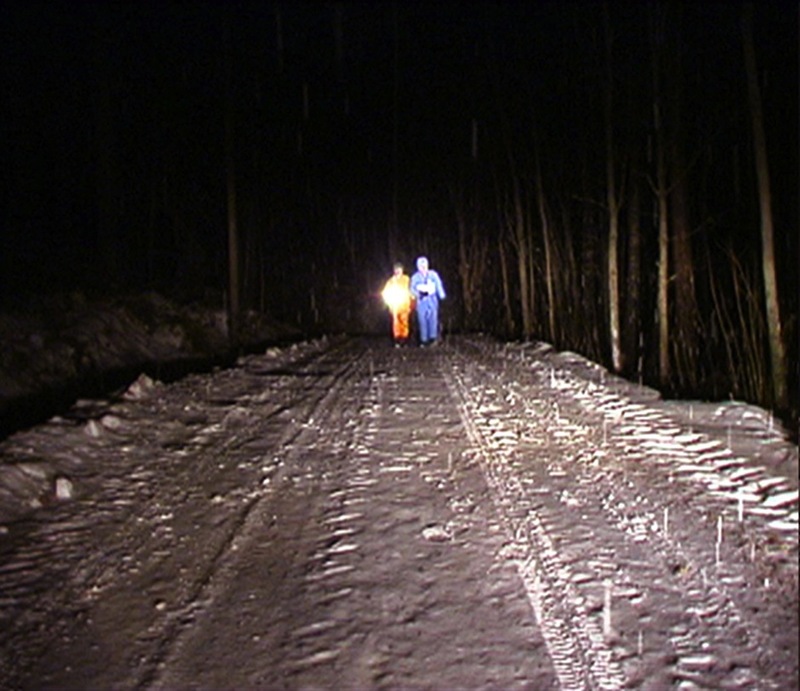 Heavy Snowflakes (2002) is filmed in Kirkkonummi; a small town 30 kilometres from Helsinki , when the first snow was falling. I filmed this portrait of my parents in a landscape which created a space both separating and connecting us. Only the local cars drive on the road which is isolated from the motorway by a thin slice of forest and a field. The sounds of the motorway and airplanes can be heard in the distance. The walking couple is accompanied by a piano version of a Lutheran hymn, which describes a child’s belief in the existence of a higher authority. ‘Heavy Snowflakes’ 2002. Video still. Video installation. Mini DV transferred to DVD. Duration 5 min 15 sec. Sound Stereo. Dimensions variable. Music by Verity Susman. Sound design by Ville Hyvönen and Jukka Vallisto.